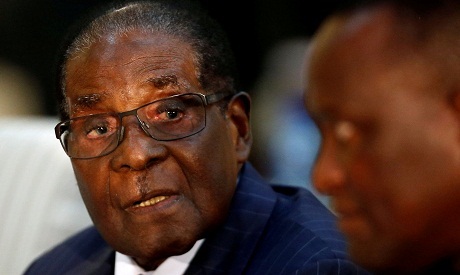 File Photo: Zimbabwean President Robert Mugabe attends the 2nd Session of the South Africa-Zimbabwe Bi-National Commission in Pretoria, South Africa October 3, 2017 (Reuters). "The world is moving... young people are taking charge, look at France, look at Canada, look at New Zealand -- look at the United States," he said. "Most of the young people out there are connecting with our message, are connecting with my age -- they are connecting with the vision I'm articulating," said Chamisa. He will face off against 75-year-old Mnangagwa, whose ZANU-PF party -- which has ruled Zimbabwe since independence 38 years ago -- has sought to portray Chamisa as a political novice. "Change is in the air -- it's almost everywhere," Chamisa said, suggesting that Mugabe's exit from public life was "the beginning of that change". "There is no way Mnangagwa is going to beat us, he is going to be a distant second -- we are ahead by miles." "But we are still very optimistic -- once we have the printing of the ballot papers in a manner that is transparent, we are going to win hands down," he said.